The brave life and death of (my/author's) husband Danny Pearl. 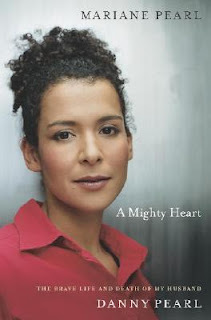 A Mighty Heart is one of the most moving books I have read in a long time. It was a welcome surprise. The abduction and execution of journalist Daniel Pearl was a story I heard about when it was happening. I knew it happened, but it's only now that I can truly say that I know. I was prepared to be bored of this book but I wanted to read it anyway. Mariane Pearl intrigued me. How did she really take it? How has she been since? Surprisingly though, she captivated me. It was about what I imagine to be the most painful moments in her life, and yet, she told the story so well and with so much detail. She is a skilled writer, with the gift to make people understand. I write this book for you Adam, so you know that your father was not a hero but an ordinary man. An ordinary hero with a mighty heart. That sums it all up for me. Danny and Mariane Pearl are, without a doubt, soulmates. They had found each other, fallen in love, and pursued their dreams together. Danny's work with The Wall Street Journal took him to many different countries. Wherever he went, Mariane went too. It worked for them because they both understood that it was their calling, as journalists, to seek out the stories and educate the rest of the world. Being a couple of mixed race also made it easier for them to blend in, to become a true citizen of the world. They were not oblivious to the risks though. They knew very well that in the world post 9/11, and in the very work they sought to do, they put their lives at greater risk. Yet they continue. The book is more than just the story of their life and love. It is as much a story of our world. It gives us an opportunity to look at the biggest threat facing the world today: terrorism. To me, it gives terrorism a human face. For a book written by a victim, it was refreshing that there was no finger-pointing, and there was no hate. It's true. Mariane Pearl had no animosity against the Pakistanis. Unlike how I'd imagine how foreigners would be, she dealt with and trusted a specific group of Pakistani law enforcement to head the search for her husband. After the ordeal, she kept in contact with them still. That says something about her character. As a young girl, I had dreams of becoming a journalist someday. It didn't happen. People like Mariane and Danny should be the kind of journalists that our youth should aspire to be. This book is a keeper. I see myself reading it over and over in years to come. Get your copy here: A Mighty Heart .